If you’ve wanted to go antiquing in Newberry, South Carolina, now is the time as we celebrate the holiday season with a Holiday Open House in Historic Downtown! 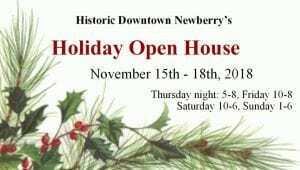 The Newberry Holiday Open House runs from the evening of Thursday November 15 through Sunday November 18, 2018. 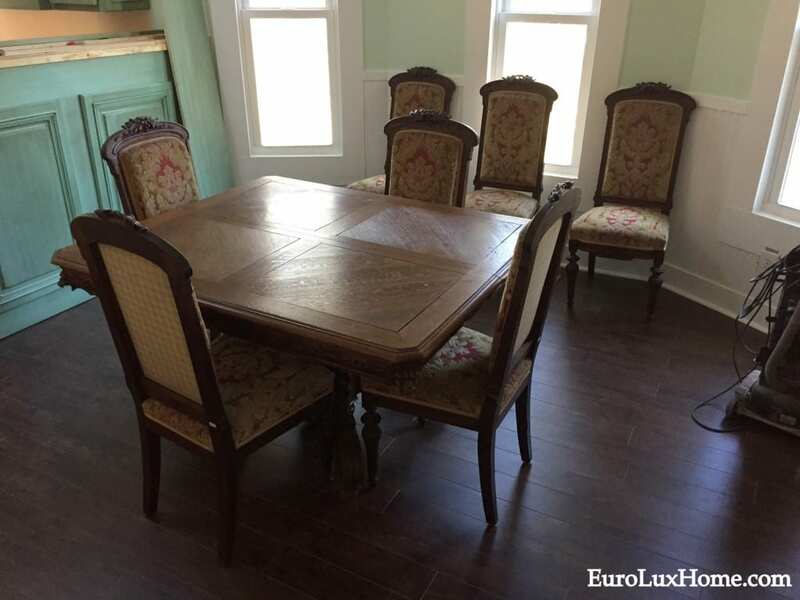 EuroLuxHome.com is joining the party with a 15% discount on all the antiques at our EuroLux antiques store on Main Street. Businesses participating in the Open House roll out the welcome mat with refreshments, drawings, door prizes and sale prices. If you are looking for a Thanksgiving centerpiece or the perfect gift for a relative, this is the time to explore Main Street and the Historic District. If you’re making your list and checking it twice, the Newberry Holiday Open House helps you get ahead on shopping for holiday gifts. Many business will offer longer opening hours to welcome in the holidays. Also enjoy a meal at a restaurant to help you get into the festive spirit before shopping… or afterward to celebrate your wonderful purchases! 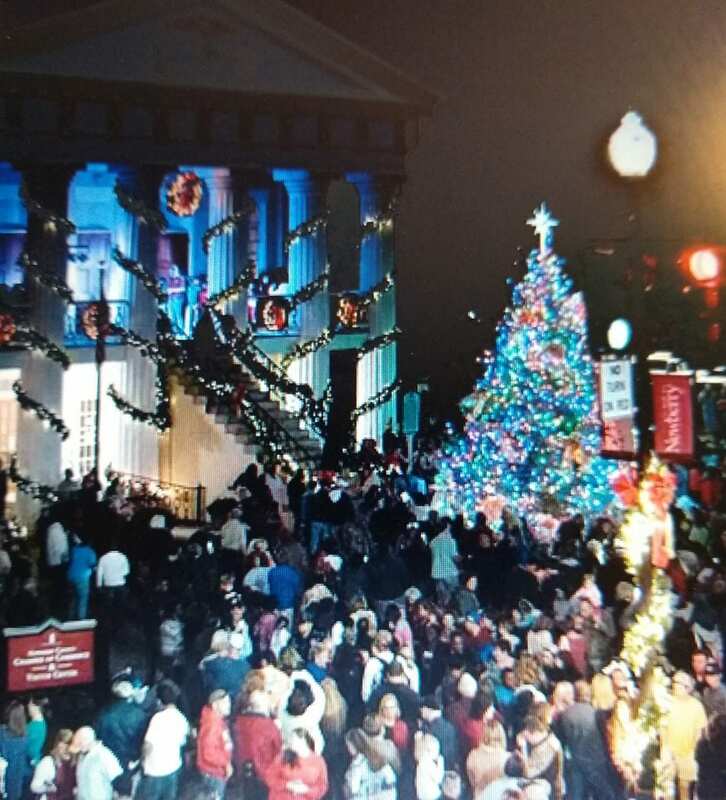 As the icing on the Christmas cake, don’t miss the Main Street Lights and the lighting of the Christmas tree on Friday November 16, 2018. We get into a nostalgic holiday mood between 5 pm and 6 pm, listening to caroling at the tree by members of the Southern Victorian Society, dressed in full replica Victorian era clothing. The official lighting ceremony begins at 6:15 pm, showcasing local school choirs, then we join in the countdown to light the town at 6:30 pm! Wandering carolers from the Newberry College Madrigal Choir add to the magic all evening. You can also stop by for a FREE showing of the movie Polar Express at the Ritz Theater at 7:30 pm. 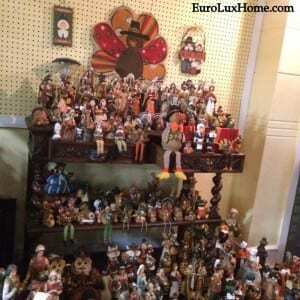 Here at EuroLux Home antiques store at 1409 Main Street, we’ll offer a 15% discount throughout the Holiday Open House. 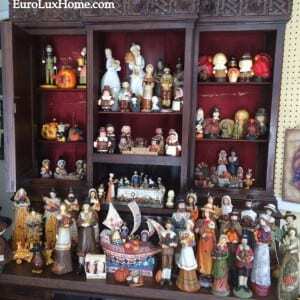 You will easily recognize us by Kathy’s collection of Thanksgiving pilgrims in our store windows! 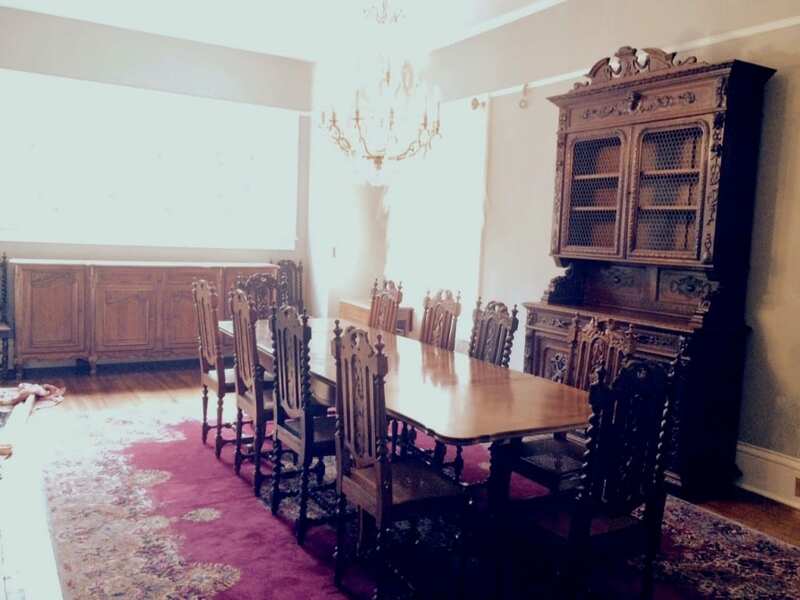 We have lots of beautiful antique French furniture that we’ve brought back from our antiques buying trips in Europe, as well as smaller pieces of home decor from vintage chandeliers to kitchenware. If you don’t live nearby so you can’t join in the Holiday Open House and come antiquing in Newberry, keep watching our blog to hear about a cool holiday discount at our online store. 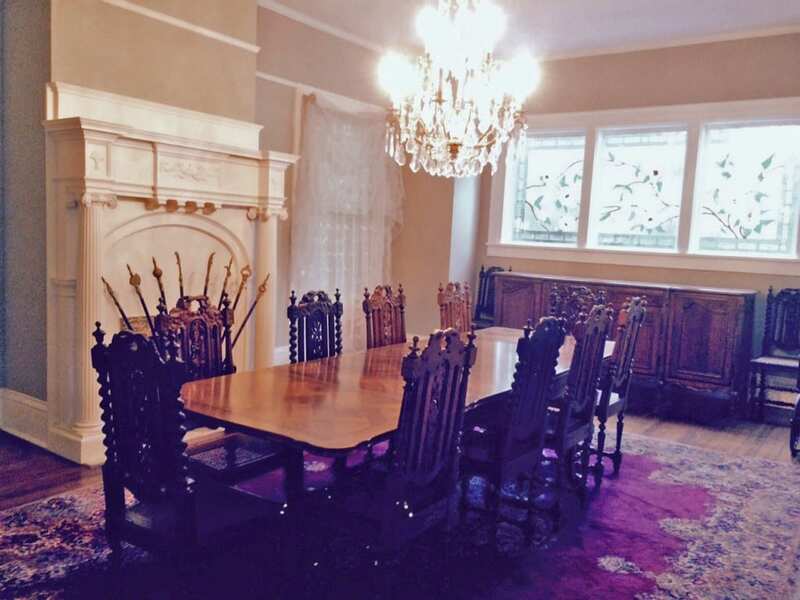 That way, you can find the perfect unique piece of furniture or decorative accessory for your home wherever you live! 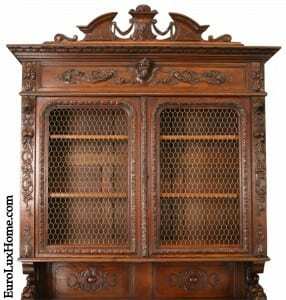 This entry was posted in Holiday Fun, News and tagged Antique Furniture in Newberry, Antiques in Newberry, Antiquing in Newberry, Downtown Newberry South Carolina, Newberry, Newberry Antiques, Newberry South Carolina on November 10, 2018 by admin. 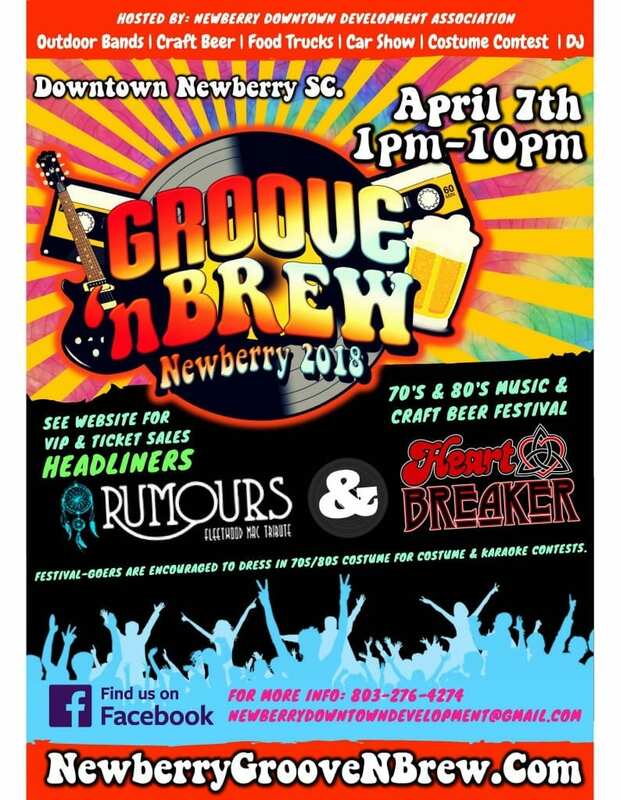 The first ever Groove ‘N BrewFest is a 1970s/80s music and craft beer festival that will rock Downtown Newberry, SC, on Saturday, April 7, 2018. I am excited about it because I am Vice-President of the Newberry Downtown Development Association, a collection of enthusiastic residents, business and property owners who want to make Downtown Newberry a better place. Earlier this year, we held a retreat where we challenged ourselves to do something really big to improve our local economy. We decided that if our local historic theatre, The Ritz, was a fully-functioning business as a concert venue/movie theatre, that it would significantly increase foot traffic Downtown, which would in turn, attract more businesses to locate here. So we decided to hold a street festival as a fundraiser to collect a pool of funds for economic development grants. 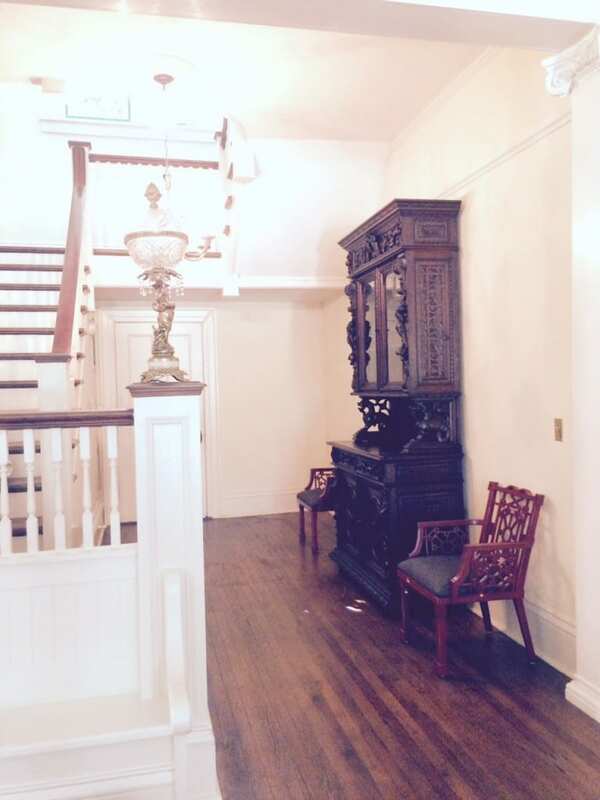 We are hoping that the Newberry Community Players, who own The Ritz Theatre, will be our first grantees. We’d like to be able to purchase them a permanent sound system so that they can have more events, raise more money, and little by little restore and revitalize this historic Art Deco building from 1936. This is the story behind Groove ‘N BrewFest — a 70s/80s music and craft beer festival that will happen on Saturday, April 7th from 1 pm to 10 pm in Downtown Newberry. We will have 25 regional craft beers and a wide variety of food trucks. 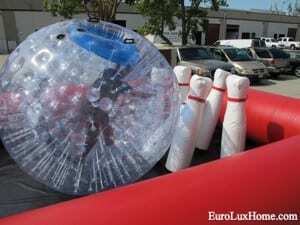 I am also excited about the games – human bowling, a giant Operation game, and a bungee jumporee where you can jump 20 feet in the air – that should be a lot of laughs! Greg has headed up the music committee and we’ll have bands playing 70s and 80s music on an outside stage all day. J-E-T opens the day from 1 to 5 pm. All festival-goers are encourage to dress in 70s/80s duds, so we’ll have karaoke and costume contests hosted by Z93, a local Columbia radio station, between 5 and 6 pm. From 6 to 10 pm, 121 Band will continue to rock out your favorite 70s/80s hits. The festival and outside music is free. A $40 Advanced purchase ticket includes the two tribute bands, an over-21 wristband with ID, a festival cup, and one craft beer. A $50 Advanced Purchase VIP ticket includes the two tribute bands, an over-21 wristband with ID, a festival cup, two craft beers, early access for best seating, and access to VIP bathrooms during the festival. A $50 Day-Of ticket includes the two tribute bands, an over-21 wristband with ID, and a festival cup (beer not included). We have worked incredibly hard over the past three months to launch this new festival, which will actually be Newberry’s first green festival! It has been a labor of love and we really hope the community will come out and drink a beer with us to support our hard-work and help raise funds for economic development grants to make Downtown Newberry a better place! Come by Groove ‘N BrewFest and say hello! 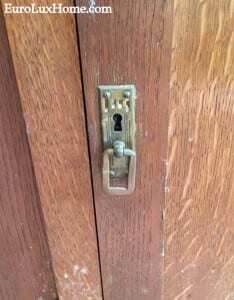 This entry was posted in News and tagged Antiquing in Newberry, Downtown Newberry South Carolina, Groove n BrewFest, Newberry, Newberry South Carolina on April 3, 2018 by admin. 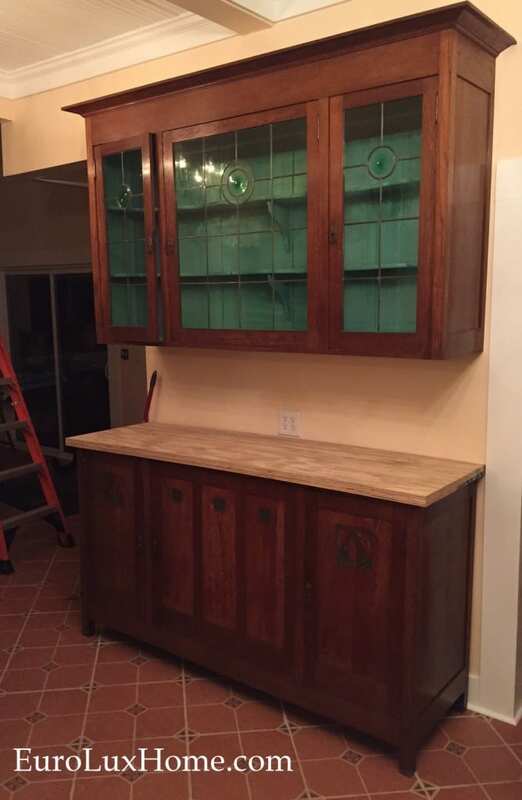 In my previous Kitchen Krazy blog post, I explained our design inspirations and some of our furniture ideas for the kitchen in our 1920s vintage bungalow. Let’s see how it worked out! 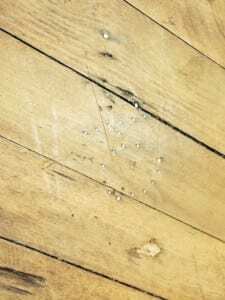 Greg sanded down the kitchen cabinet door frames that we had repurposed from the spare doors on an antique cabinet we bought to use as a bedroom bookcase. (You can see the finished bookcase here.) 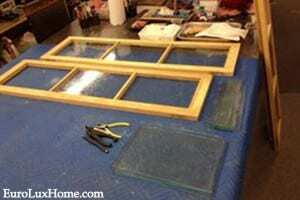 I cut new glass panels using seeded glass that looks like old glass. We knew those would be the upper cabinet doors on either side of the sink. 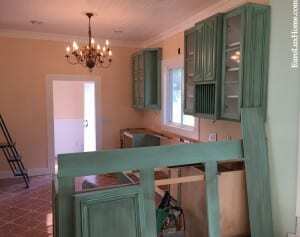 From there, John Hopfensperger of Cayce Custom Cabinetry designed the kitchen cabinets. 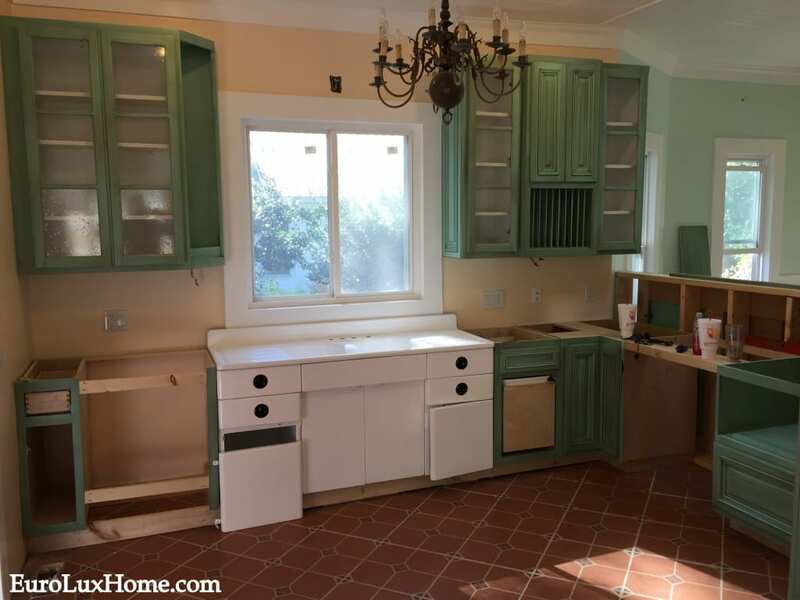 John’s designs included all of our wish list items such as a rack for plates, shelves next to the window for growing herbs, a lazy Susan corner cabinet for pots and pans, a slide-out garbage can, and a spot for the microwave off the counter. The vintage light fixtures were hung first. 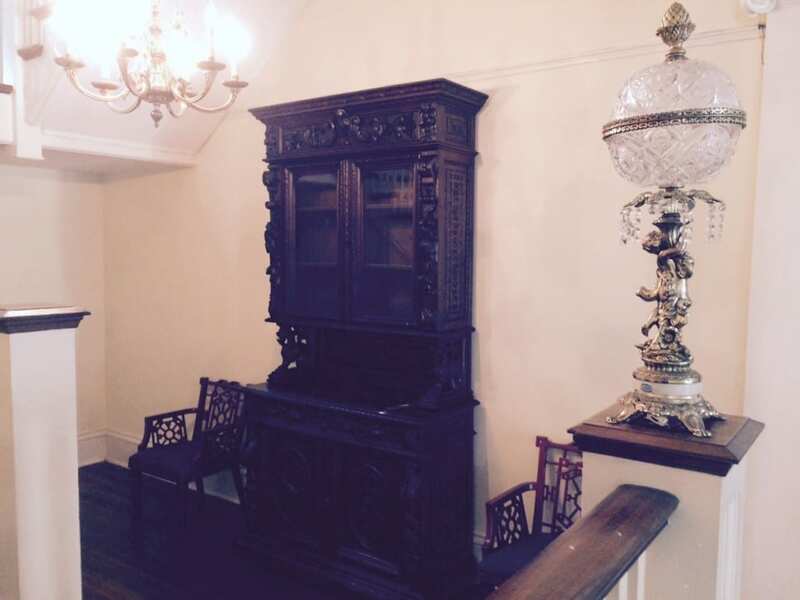 In addition to kitchen cabinets, I also wanted to use an antique buffet in the kitchen to add even more character to the space. 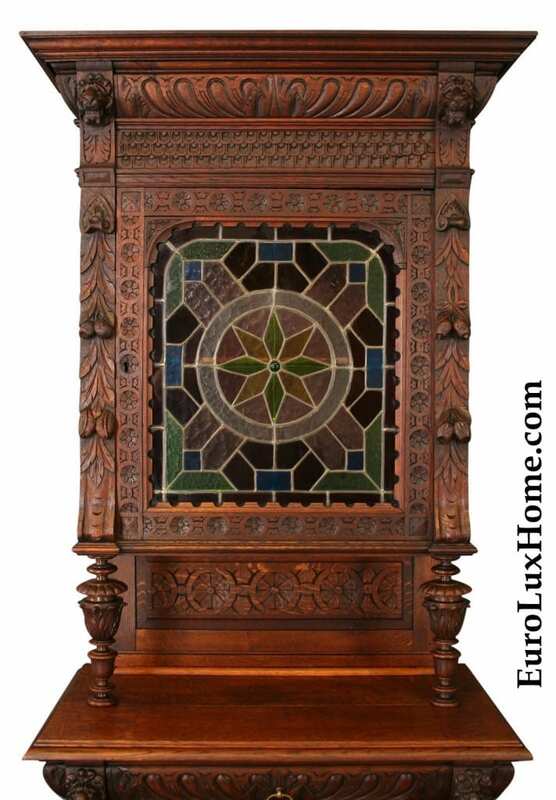 We found an 1920s Arts & Crafts antique buffet in France several years ago and knew it was the perfect piece! 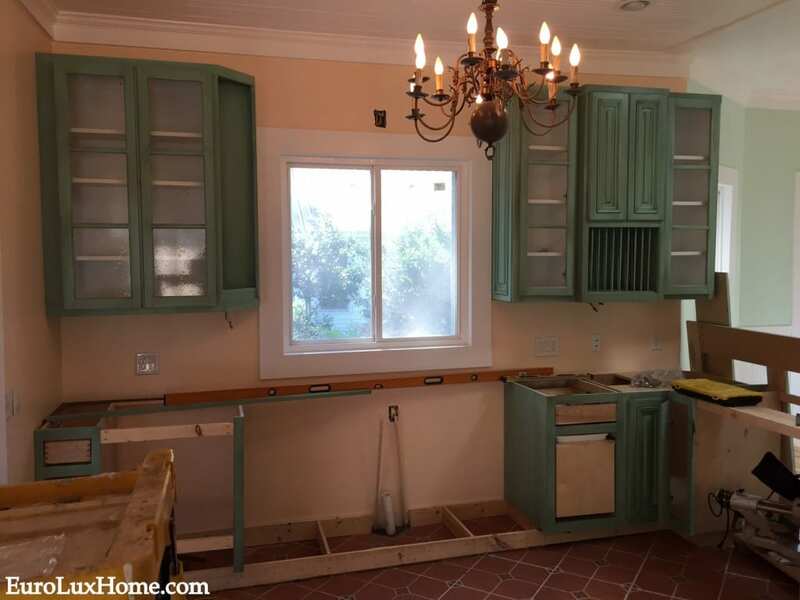 It was even painted on the inside with the same blue-green color that I wanted for the cabinets and it has wonderful antique glass doors. Although the top would normally sit on the bottom cabinet, we wanted to hang the top on the wall in order to create more counter space. 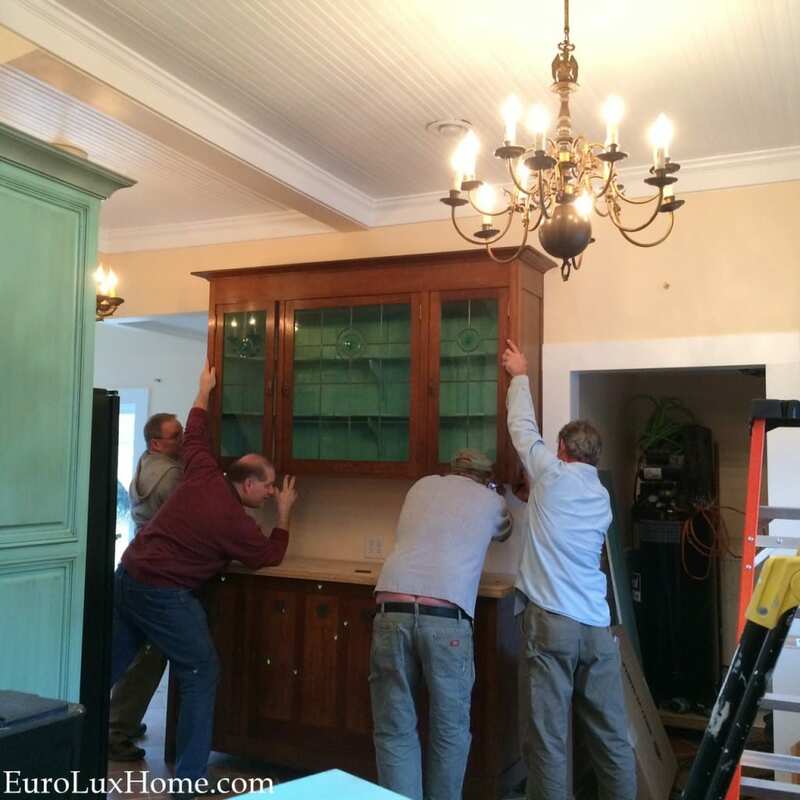 I held my breath while Greg and the cabinet installers hung it! 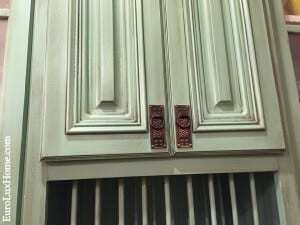 The hardware on this cabinet also inspired the choice of hardware for the rest of the kitchen. I haven’t completely moved everything in yet nor finished decorating my wonderful kitchen, but here are some early “after” photos. Of course, I am also not planning to have plywood counter tops. 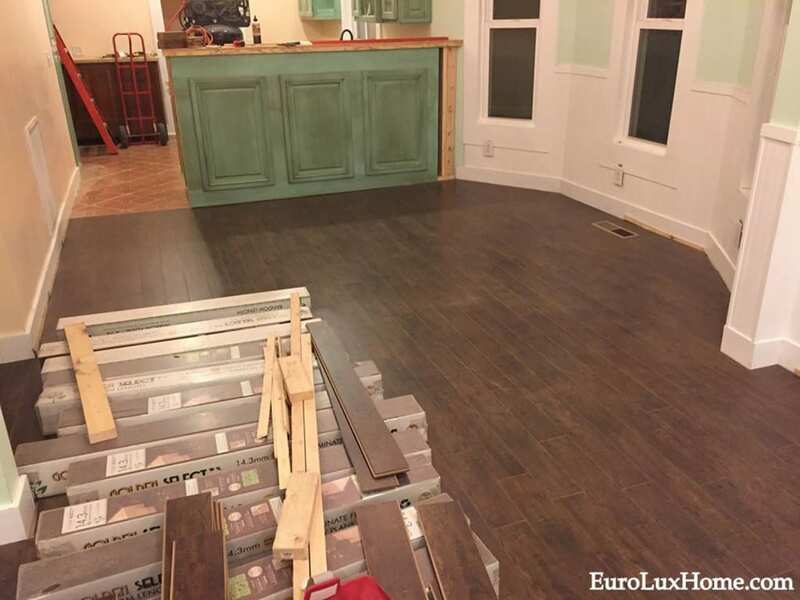 I want copper counters, but that is still a project we haven’t finished yet. We also have work to do for a backsplash. 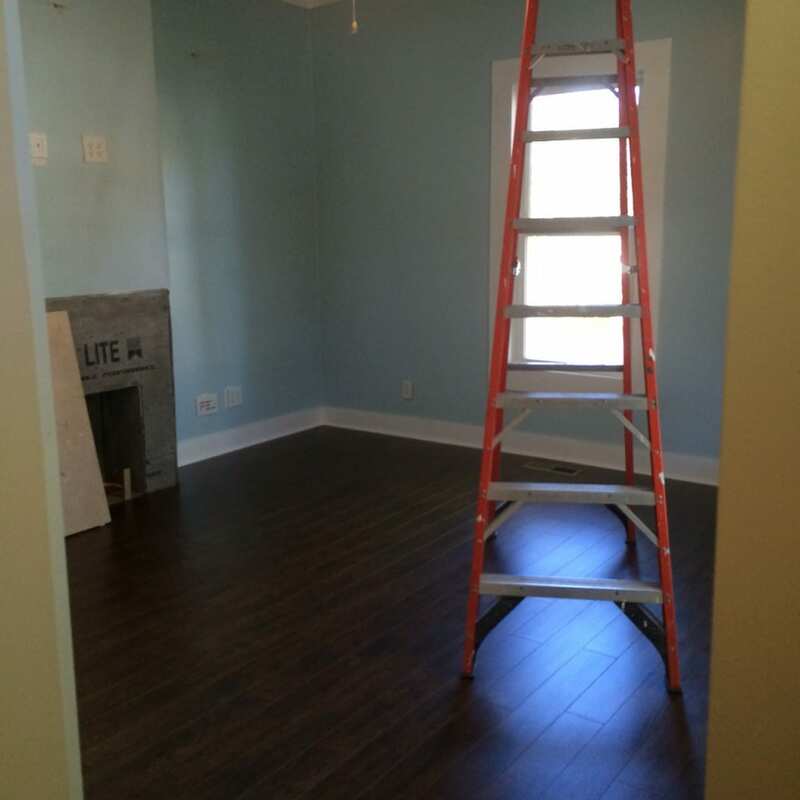 Don’t worry – you’ll see finished photos eventually! Although the house is far from finished, with the installation of the kitchen, we were finally ready to move in – after three years of hard work! 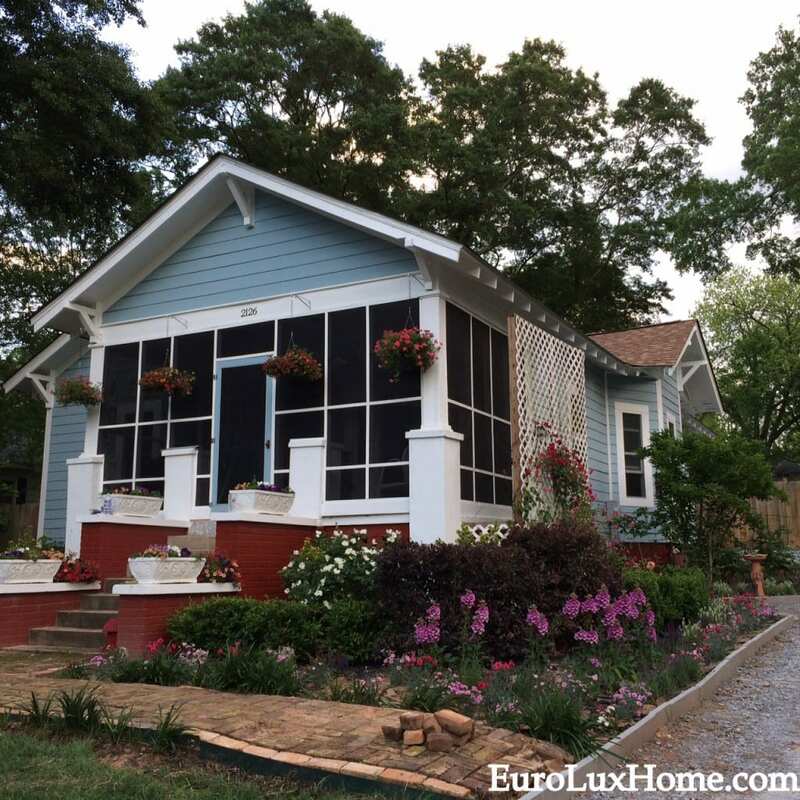 This entry was posted in Vintage Life: Our 1920s Bungalow and tagged 1920 Bungalow Renovation, 1920 Bungalow Restoration, Antique Buffets, antique cabinet, antique french buffet, kitchen, Newberry South Carolina, old house renovation, vintage on July 28, 2016 by admin. 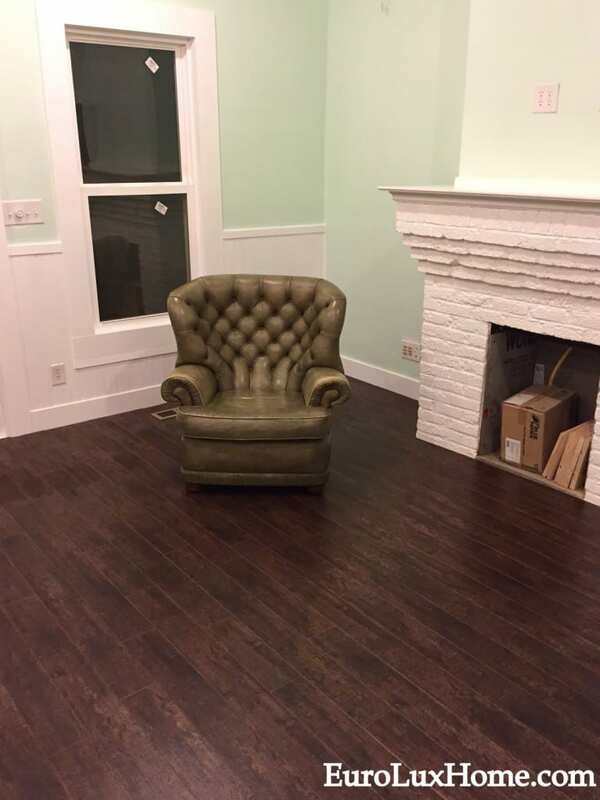 Before we started the renovation of our 1920s vintage bungalow, Greg and I talked about which things were most important to each of us. 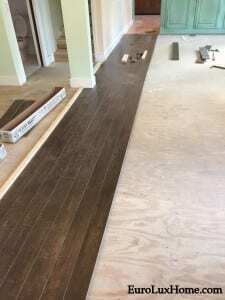 Greg (the music lover) wanted the whole house to be wired for media so that he could listen to his favorite tunes in surround sound, no matter which room he was in. 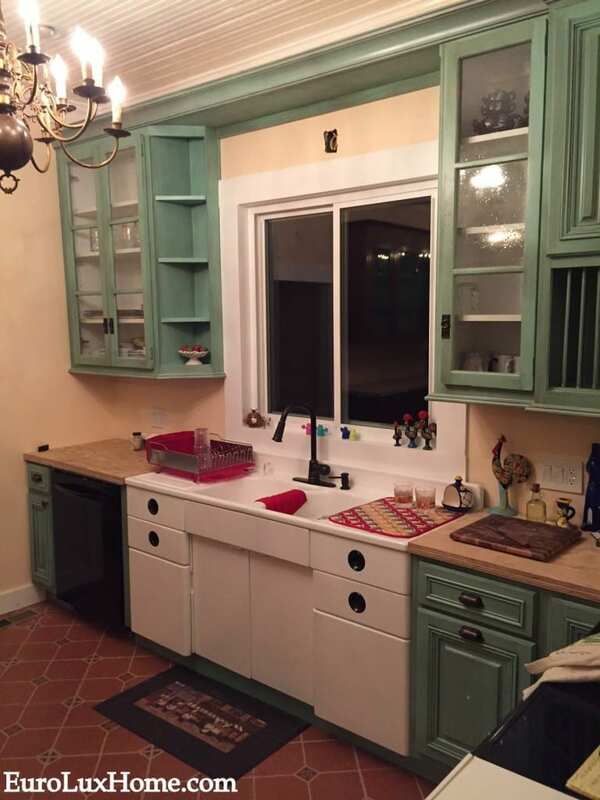 As for me, I wanted a gorgeous and unique kitchen – unlike anything you would see in most homes. 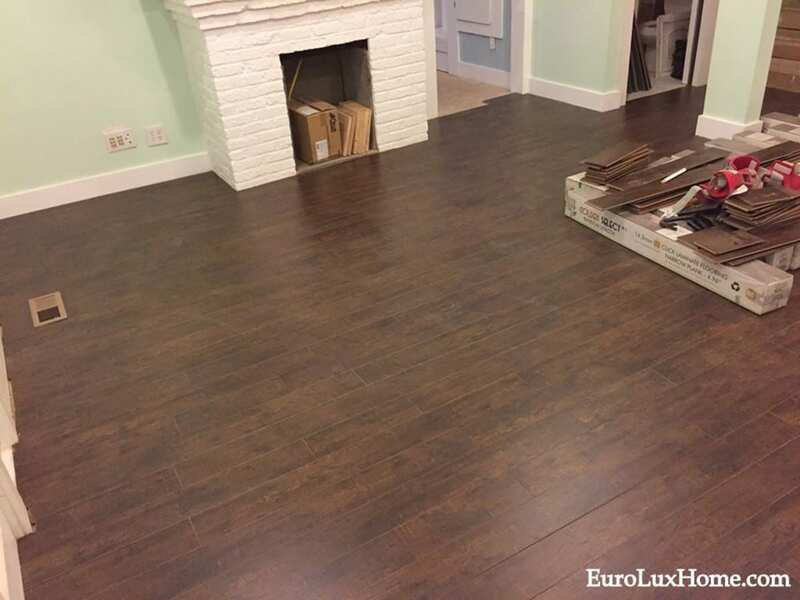 Although I know it is very trendy, I really didn’t see myself in a kitchen with dark wood cabinets and granite countertops and stainless steel appliances. 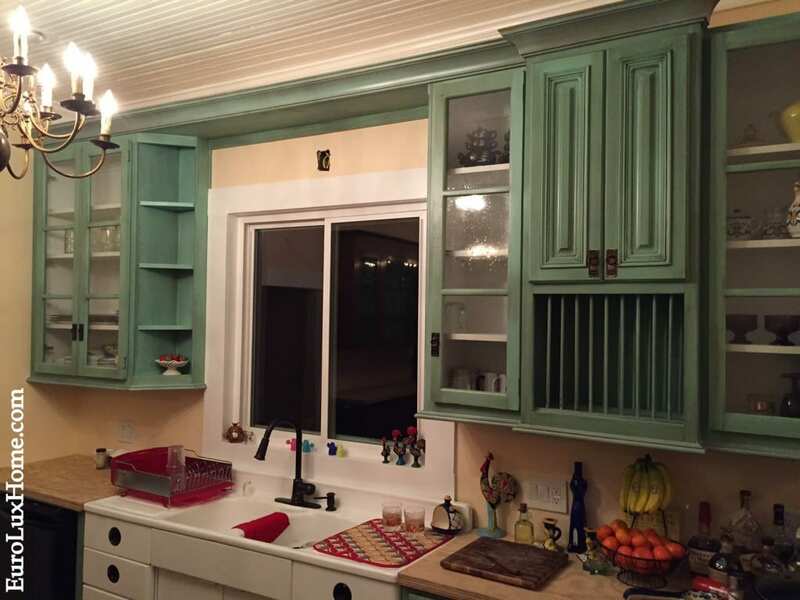 I wanted colorful, painted cabinets that looked vintage and had a great deal of character. 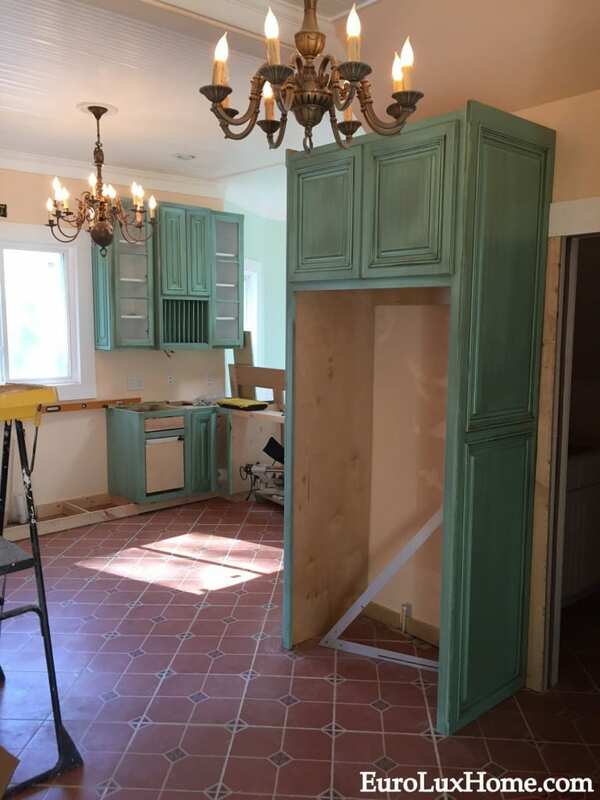 Stock kitchen cabinets were out of the question so we hired a local craftsman, John Hopfensperger of Cayce Custom Cabinetry. I fell in love with his ability to create custom paint finishes with as much distressing as I’d like. 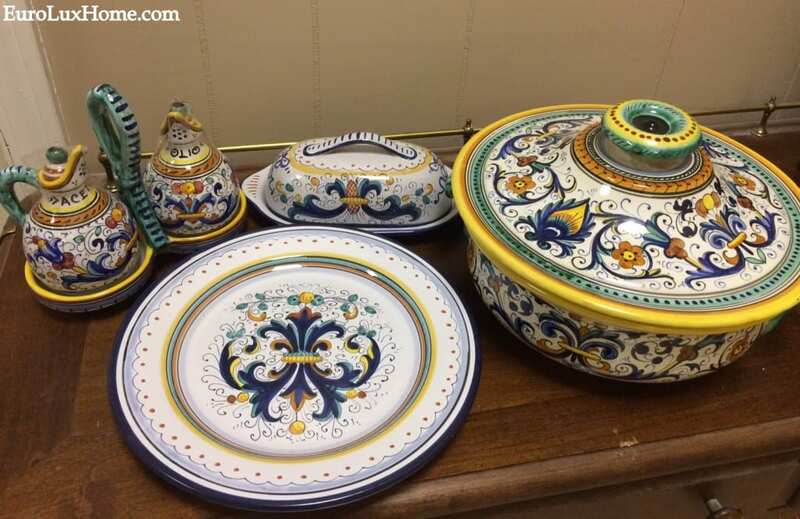 I wanted the aqua green-blue color that you see on vintage 1957 Chevrolets because it matched my hand-painted Italian Deruta dishes that we bought in San Gimignano when we lived in Europe. I know the vibrant colors are not for everyone, but I love it! The style of the kitchen cabinets were influenced by this antique kitchen cabinet that we found at the Antique Tobacco Barn in Asheville. We actually bought that cabinet to be a built-in bookcase in our bedroom so I can use it to display my favorite books and family photos. (It’s not full yet in this photo… I’m still working on it!) 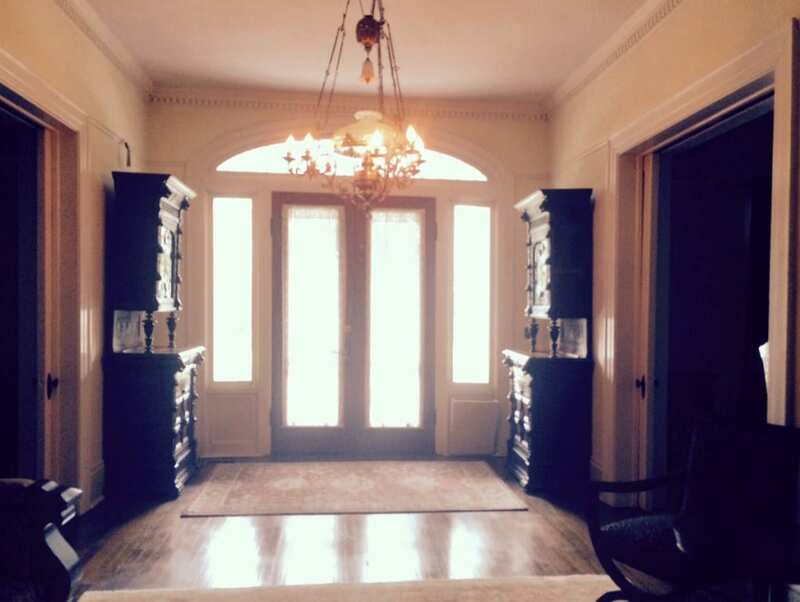 The three upper areas have glass doors and the three lower areas have solid wood doors. 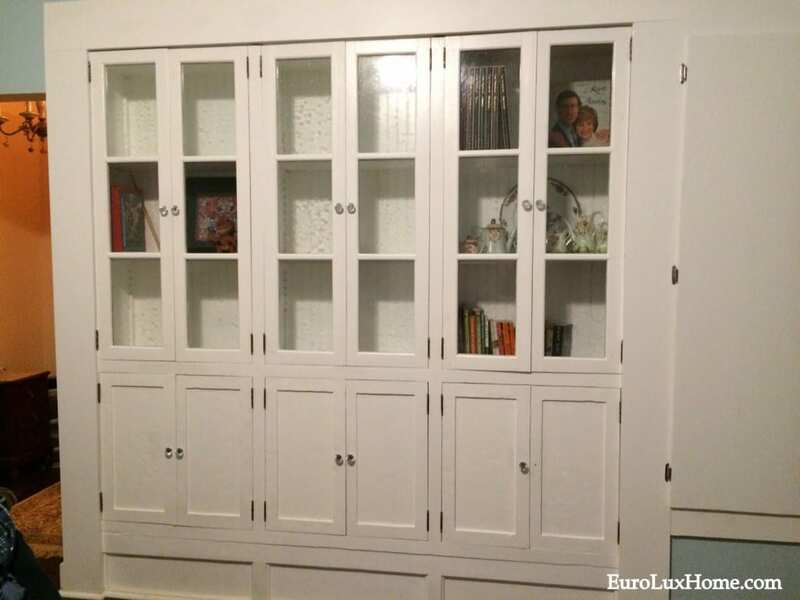 There were four extra glass doors that came with this bookcase, and we decided those would make great kitchen cabinet doors. You might remember that I blogged about an awesome vintage double sink (it still has the original Sears catalogue sticker from 1952 inside) that we found at a ReStore when we were antiques shopping in Asheville. 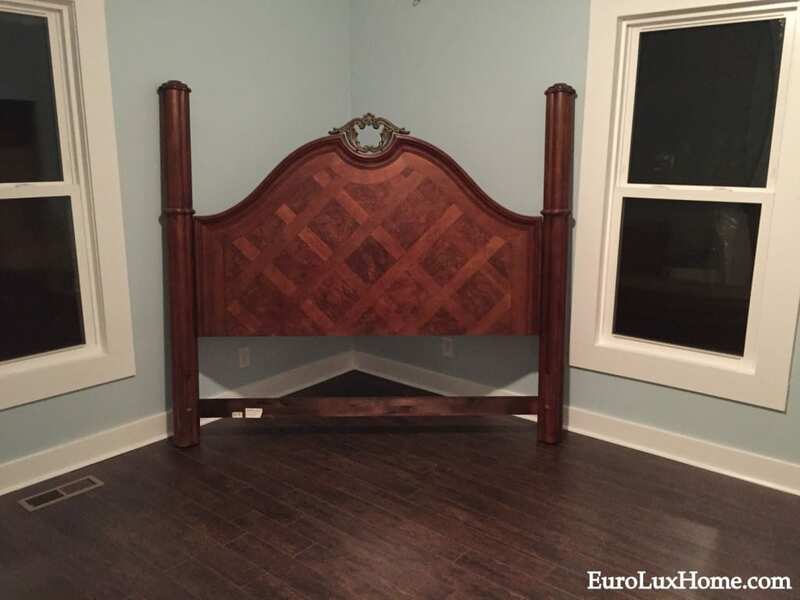 We had it completely restored and here it is mostly installed. That’s the background story, I’ll show you in my next post how it all turned out! 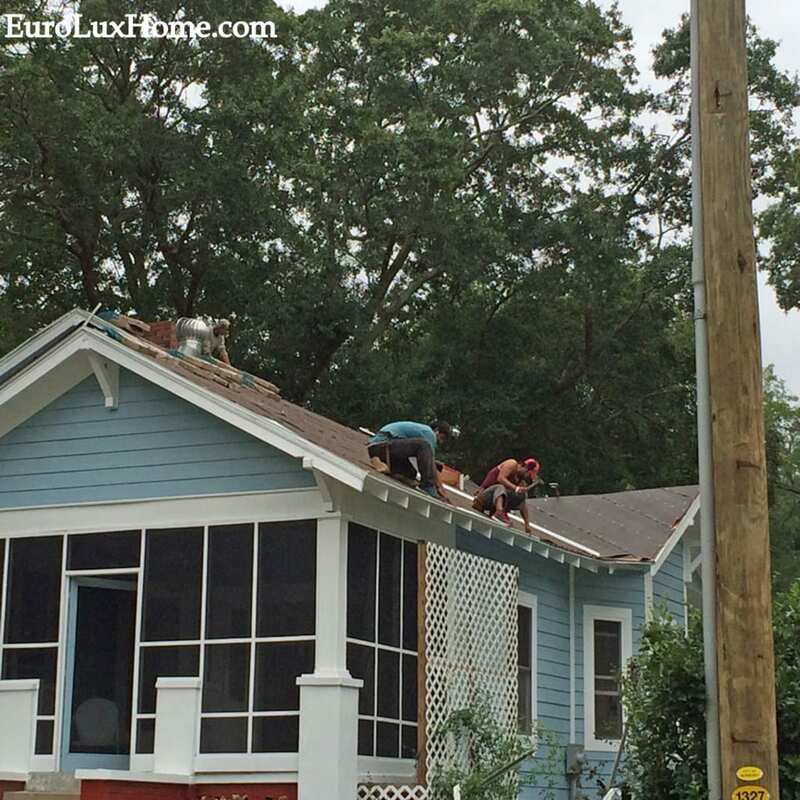 This entry was posted in Vintage Life: Our 1920s Bungalow and tagged 1920 Bungalow Renovation, 1920 Bungalow Restoration, antique cabinet, Deruta ceramics, kitchen, Newberry South Carolina, old house renovation, vintage on July 27, 2016 by admin. 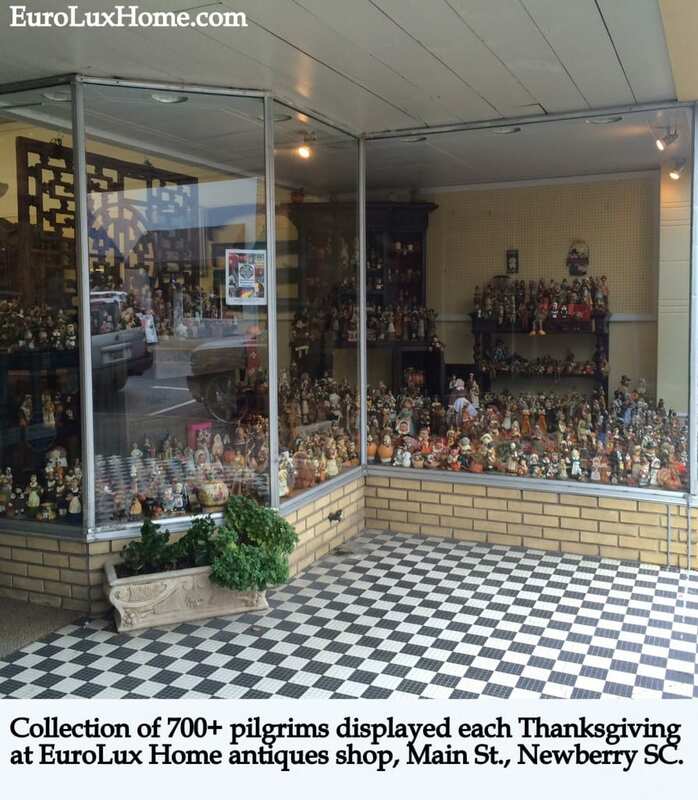 With Thanksgiving just around the corner, I talked with my mother-in-law Kathy about her collection of more than 700 pilgrims. 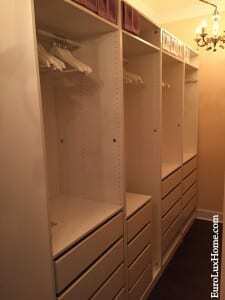 We have always been big fans of displaying personal collections in your home. Recently I blogged about decorative ways to display a collection and ways to display your ceramics collection. 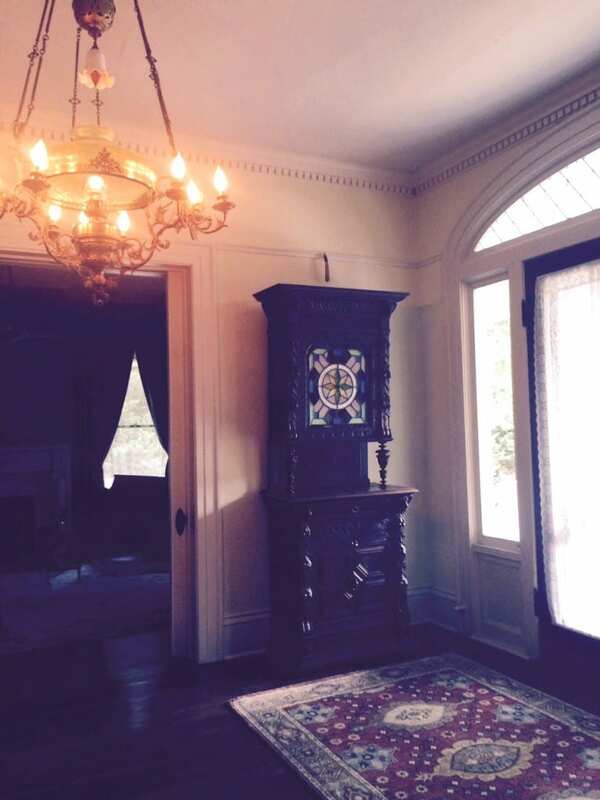 I think a collection adds character and personality to your home and looks so interesting creatively grouped together. To use one of my favorite Southern expressions (I occasionally try to throw them in to fit in with the locals, bless my heart) my mother-in-law, Kathy, has a pilgrim collection “what-am!” For those of you who need a translation, that is a very large and completely impressive collection of pilgrims – and other Thanksgiving-related – objects. Not long after that, Kathy found another pair of pilgrims in a local K-Mart, and a collection was born. Friends and family gave her pilgrims around Thanksgiving every year and sometimes as holiday gifts. 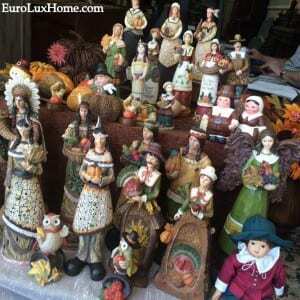 The burgeoning collection grew to include Indians, pumpkins, turkeys, cornucopias and all things Thanksgiving-related. 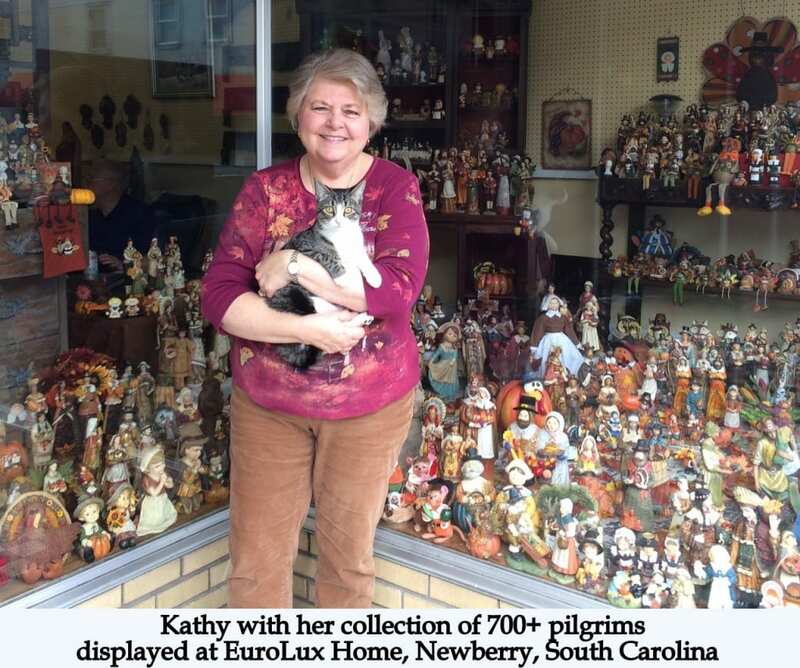 To date, Kathy estimates she has around 700 objects in her prized pilgrim collection – it is incredibly impressive when displayed together, as she does in the EuroLux Gallery window starting in October every year. Passersby can’t help but stop in their tracks and exclaim with wonder! Kathy especially loves pilgrims because to her they represent courage, bravery, and fortitude. She greatly admires their willingness to leave behind everything familiar and set out to build a new life in an unknown world, far across the ocean. The pilgrims had to make do with so little and work so hard in order to survive. It really bothers Kathy that Thanksgiving is the holiday that doesn’t get much airtime. Halloween runs into Christmas in our retail stores, but Thanksgiving doesn’t get much attention – probably because the focus isn’t buying stuff. She thinks we should take more time to honor the bravery of the pilgrims – and to be thankful for what we have in our lives, including relationships with family and friends. Kathy’s absolute favorite pilgrimage site (sorry, couldn’t resist the pun) was to Plymouth, Massachusetts, which she describes as “pilgrim heaven.” There were shops on every corner with an amazing selection of pilgrim-related things! Some were even life-size, but Kathy restrained due to limited space in the car during the New England adventure. She did enjoy seeing Plymouth Rock and the Mayflower. 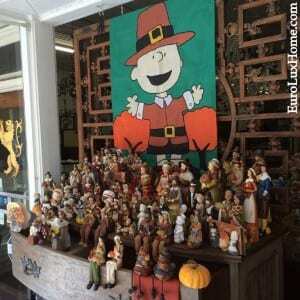 Kathy’s collection contains pilgrims in all shapes and sizes – monkeys, bears, dogs, foxes, chipmunks, cats, mice, and plenty of owls dressed as pilgrims. She tries not to duplicate the ones she has, and she is always glad to serve as a pilgrim matchmaker when she finds a single pilgrim man or a pilgrim woman all by their lonesome. In fact, she found a single pilgrim woman in Waynesville, NC, who had lost her mate to breakage, and paired her up – a year and a half later – with the original matching pilgrim man, whose mate had been stolen from a shop in Columbus, OH! Reunited at last in a happy and growing pilgrim colony in South Carolina. Kathy is a real inspiration to us, and to everyone who sees her pilgrim collection in the store window. Come and see it if you find yourself on Historic Main Street, Newberry, South Carolina. (We’re at number 1409.) We wish you and yours a very happy Thanksgiving holiday in the true spirit of the pilgrims! 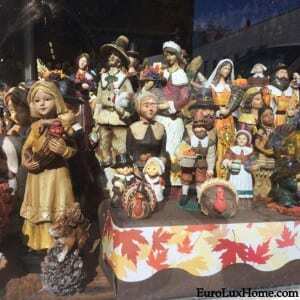 This entry was posted in Holiday Fun, News and tagged display a collection, Downtown Newberry South Carolina, EuroLux Home, Newberry South Carolina, pilgrims, Thanksgiving on November 18, 2015 by admin. 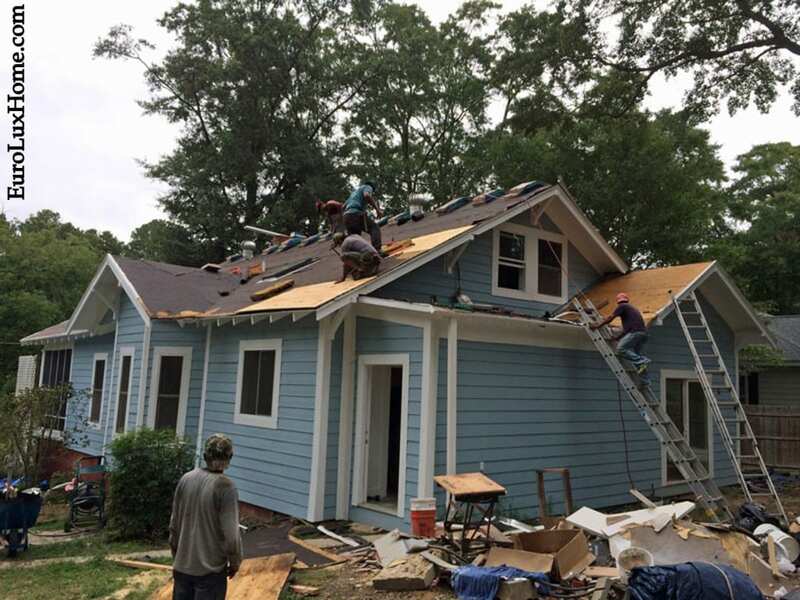 We often tell you stories about the renovation of our 1920s vintage bungalow, but I’ve got a vintage story to tell you today about our buildings on Main Street, Newberry, SC. That building has an upstairs loft which has never been renovated, nor used as anything other than non-air-conditioned storage space. 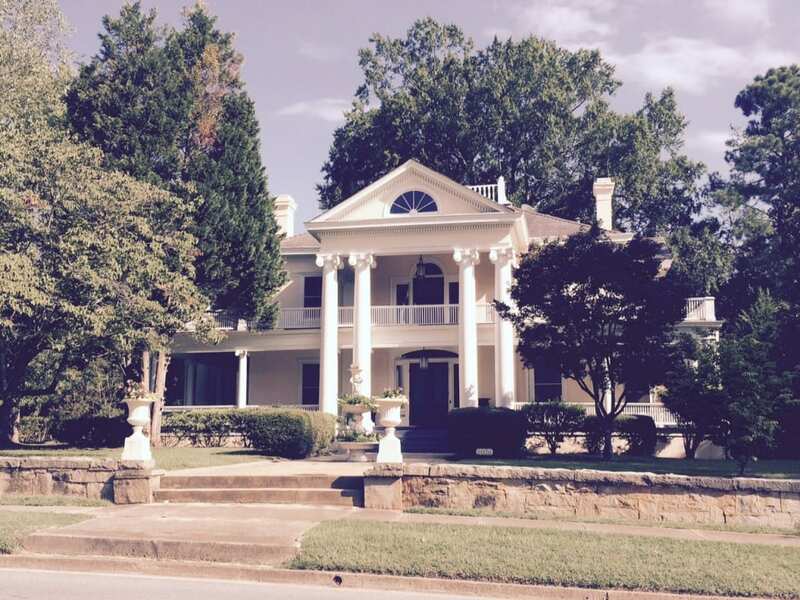 When we purchased the building years ago, we planned to renovate, like our near-neighbors the Millers did in my post about Historic Newberry Main Street. Here’s the loft. 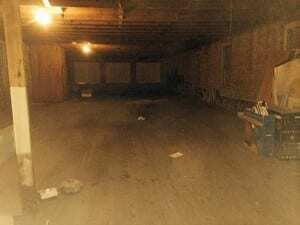 The photo is a bit dark because the windows are boarded up and all of the light bulbs were burnt out. I lugged a ladder up and changed them all but it remains pretty dark. It’s still is a very cool space and it has a neat story. 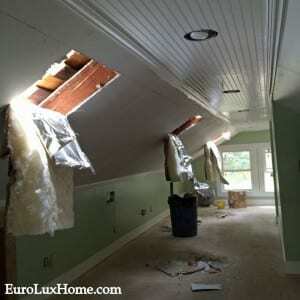 We intended to convert it into an upstairs loft apartment while expanding our business into the downstairs. BUT! 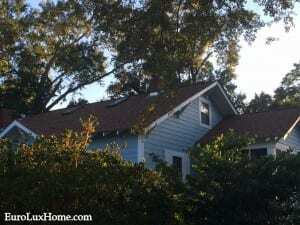 The best laid plans… We ended up finding our little vintage bungalow that we’re renovating and since it had a yard for the dogs, we decided that would be a better way to go than the loft. We still plan to renovate the loft in the future but for now let me just tell you the great old story about the building. Back in the 1930s, Main Street in Newberry was a busy place. I shared some old-timey pictures in this Vintage Life blog post. It was the county seat, had the court house, and was the place to go shopping for all the folks that worked at the three cotton mills in town. There were actually two hardware stores in the same block on Main street, owned by two competing Lominack cousins. Those were Lominack’s Hardware (where EuroLux Home is currently located at 1409 Main Street) and Frank Lominack’s Hardware at 1403 Main Street. 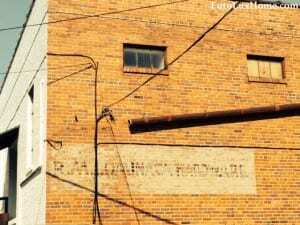 We’ve also left the Lominack Hardware painted sign on the back of the building. The story that I’ve heard said that the two cousins were always trying to one up each other in order to get more business by offering different products and services. Frank Lominack’s Hardware decided to open a shooting range in the basement in order to corner the market and draw more folks into his hardware store. So the story goes, in November of 1934 a stray bullet hit the dynamite that was also stored in the basement and blew up the building! 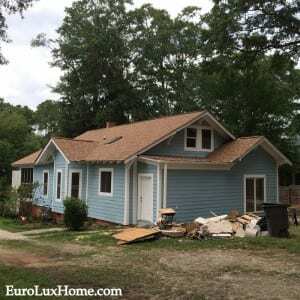 You can see more about it in this old article in the Gastonia Daily Gazette. There was $200,000 of damage. That’s a lot of money today but in 1934 it was a huge amount of money! 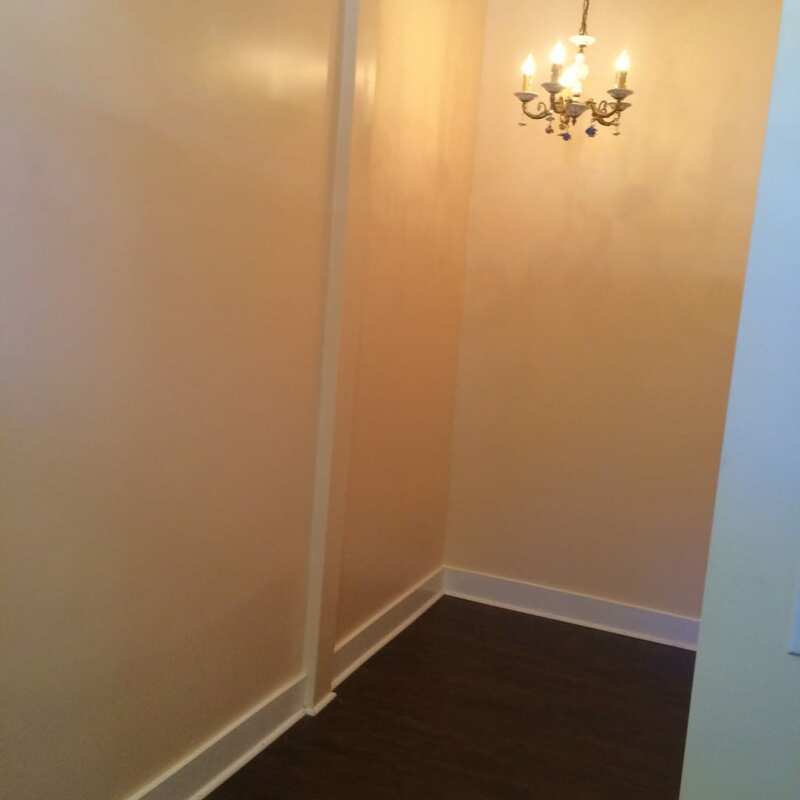 We currently own 1405 Main Street and rent it out to our tenant, Expressions, a hair salon. That previously 2 story building was occupied by a business called Livingston & Son General Merchandise at the time of the explosion. It was so damaged by the explosion that it had to be rebuilt, but the owner decided to only build it as a one-story building. 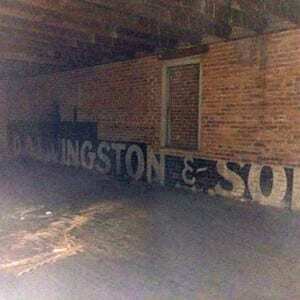 Our 1407 Main Street building was built after that business had opened, so the interior wall of 1407 Main Street actually shows the original painted advertisement that was on the exterior of the Livingston& Son building’s 2nd story. That sure was a long explanation, but otherwise you wouldn’t understand how the advertising came to be on the inside wall of our building! 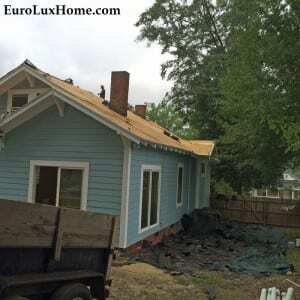 Today things aren’t quite as dramatic in our EuroLux gallery. Even all our cats and dogs play nicely together rather than competing with everyone within our fuzzy family. And I’m very relieved that Greg’s other business in the building is The Computer Doctor… NOT a shooting range! 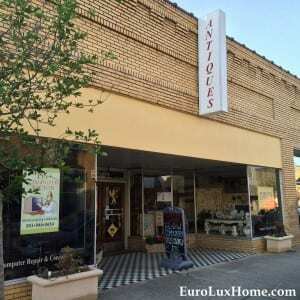 This entry was posted in News and tagged Antique Furniture in Newberry, Antiquing in Newberry, Downtown Newberry South Carolina, EuroLux Antiques, EuroLux Home, Newberry South Carolina on September 15, 2015 by admin.